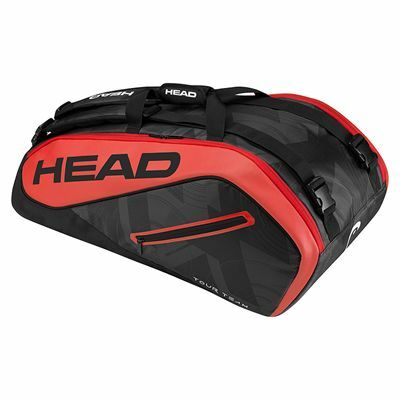 Made for the serious competitors, the Head Tour Team Supercombi 9 racket bag has plenty of room for the equipment and accessories and boasts two large compartments, as well as an interior mesh pocket and an external zipped pocket. It accommodates up to 9 rackets and uses special climate control technology (CCT+) to protect the rackets from variations in temperature. This spacious bag features a 2-way carry system enabling you to carry it over your shoulder or as a backpack. for submitting product information about Head Tour Team Supercombi 9 Racket Bag SS17 We aim to answer all questions within 2-3 days. for submitting product information about Head Tour Team Supercombi 9 Racket Bag SS17. We aim to answer all questions within 2-3 days. If you provided your name and email address, we will email you as soon as the answer is published. A good sized bag at a very good price. for submitting product review about Head Tour Team Supercombi 9 Racket Bag SS17.